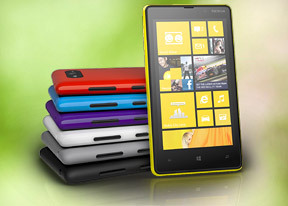 The Nokia Lumia 820 has quad-band GSM/GPRS/EDGE support, quad-band 3G with HSPA and penta-band 4G LTE connectivity. If you're in range of an LTE network, the 820 will do up to 100Mbps downlink and 50Mbps uplink. If not, HSDPA still offers reasonably good speeds at 42Mbps downlink and 5.76Mbps uplink. The local connectivity is covered by dual-band Wi-Fi a/b/g/n with DLNA, Wi-Fi Direct and hotspot, and stereo Bluetooth 2.1. Bluetooth is no longer limited as to what it can do - there's file transfer support now. There is Mass Storage mode for the internal phone storage and you can upload files without needing to install any software. There is no requirement as to where you put your files (specific folders, etc.). If the phone has the appropriate app to handle a file, you'll have access to it. Since there is no WP file manager, you'll have to access the unrecognizable files only via a computer. The Lumia 820 also has NFC connectivity, which is used in the Wallet app. Unfortunately, we won't know whether that has any potential to expand beyond its out-of-the-box functionality for at least a few more months. NFC is still useful for file sharing and it works across other platforms with NFC support. Sending a picture with a Samsung Galaxy Nexus, for instance, wasn't a problem and the same goes for web pages. NFC comes into play with some accessories too - like the JBL PowerUp speaker that automatically starts playing when you put the Lumia 820 on top of it and will charge it too. The Internet Explorer on Widows Phone 8 brings got a major upgrade, but kept its old looks. Almost everything Microsoft has done on the IE is under the hood and the end result is close to excellent. The Lumia 820 has a big enough screen for comfortable browsing, but the pixel density is average, so text can get fuzzy at low zoom levels. We expected the Nokia Lumia 820 to match the other WP8 phones we've tested in terms of performance in the SunSpider and BrowserMark benchmark tests and it delivered. Nokia is working on the Xpress Browser for Windows Phone, which does the web page compression trick independently of carriers, but that isn't available for the Lumia 820 yet. We're slightly disappointed that Microsoft and Nokia promised stuff that we wanted to try out, only to find out it's not yet available. The looking glass button on the Lumia 820 brings you to the new Bing search app. At first glance, it's the same app overall - you type in a query and you get search results from the web and there's a pretty background photo with several translucent squares you can tap to learn interesting facts about the subject.